Traffic light interactive installation developed for PiG (Project in Old Town) summer 1994, Oslo. 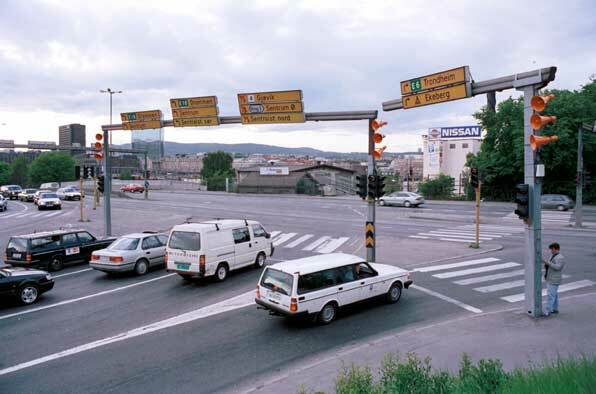 The installation was exposed to incoming car traffic in the most heavy traffic road-cross in Norway at the time. When the cars stopped for red light, the 9 highly focused Birdmachines megaphones started to play birdsongs. Each of the nine birdsongs lasted for 6 seconds and was repeated randomly as long as red light was on.On green light, the sound stopped and the cars drove away. The installation worked well with a lot of reactions from the car drivers. The stream of heavy traffic is a regular mechanism that needs to be controlled. The ornamentation of the crossing with integrated traffic controlled bird songs points to and emphasizes this mechanism as a phenomenon.